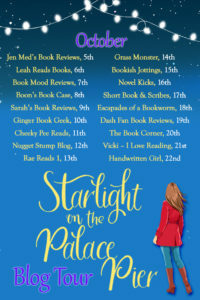 Welcome to my stop on the blog tour for Starlight on the Palace Pier by Tracy Corbett. I’m delighted to have an extract to share with you today. My thanks to Sabah Khan from Avon Books for the place on the tour. After an injury derails her dream of becoming a professional dancer, Becca Roberts heads home to Brighton in search of a fresh start. And, when a dance teacher position becomes available at the Starlight Playhouse, it seems like her stars are finally aligning. The crumbling old building might need a bit of TLC (and a lick of paint! ), but Becca is more than up to the challenge. 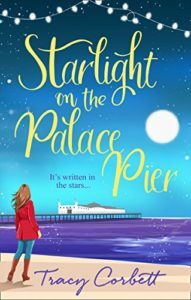 Fall in love on Palace Pier in this feel-good romantic comedy, perfect for fans of Debbie Johnson and Jill Mansell. Late-night partying wasn’t a new phenomenon. As a dancer, most of her gigs had been in the evening and it would be gone eleven by the time she left the venue. With the buzz of adrenaline flowing, sleep was impossible. So she’d often joined the other dancers and headed off to a club, staggering home in the early hours before collapsing into bed. There wouldn’t even be the luxury of a lie-in the next morning. She’d be up early for class, putting her body through its paces, running through the necessary drills, jumps and turns, always trying to perfect her technique. She’d learnt early on that you had to love dancing to stick to it. It gave you nothing back in return, no painting to display on a wall, no poem to be printed or sold, nothing other than that single fleeting moment when you felt alive. Dancers endured constant pain, rejection and injury. Not to mention years of intense training, poor salaries and cruelly short careers. And yet she’d never met a dancer who didn’t think they had the best job in the world. That rush of exhilaration, moving your body to express yourself, creating a moment of magic that transported people out of their everyday lives. And now it was over. She stopped and took a breath, hit by another wave of grief. Okay, so she might never dance professionally again, but that didn’t mean she had to give up completely, did it? People danced in wheelchairs, for Christ’s sake. She wasn’t about to let a couple of dodgy tendons stop her. It wasn’t long before she reached Preston Park, the site of many a music festival in days gone by, and the place where she’d spent so much of her youth. She walked through the ornate iron gates, glancing up to see whether the pillars still had lion heads perched on top. They did. She made her way up the long driveway to where the once grand stately home was situated. From the outside, the Starlight Playhouse hadn’t changed. The red brickwork still looked impressive, the array of tall sash windows dominated the view, and the green countryside framing the estate was stunning. As she neared the building, her mind tumbled back to the summer of 2005 when Jodi had dragged her along to the Friday night youth club. It was a strange venue to host a horde of boisterous teenagers who had little regard for an impressive structure built nearly four hundred years earlier. It was only now that the idea of using a listed building to house a games room and a disco seemed bizarre. Tracy grew up in Berkshire with her large, noisy and adorable family. 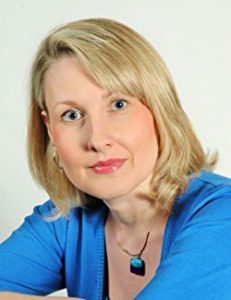 She now lives in Surrey with her partner and started writing in her late twenties, song lyrics, sketches for pantomimes and short stories, before venturing into the wonderful world of novel writing. She describes her writing style as modern tales of romance, with engaging quirky characters, who overcome adversity, grow as people and conclude in satisfying optimistic endings. When Tracy isn’t writing, she enjoys amateur dramatics and can regularly be found dressing up in various strange costumes and prancing about the stage pretending to be all manner of odd characters! The Forget-Me-Not Flower Shop was Tracy’s debut novel and her second novel was The Summer Theatre by the Sea.